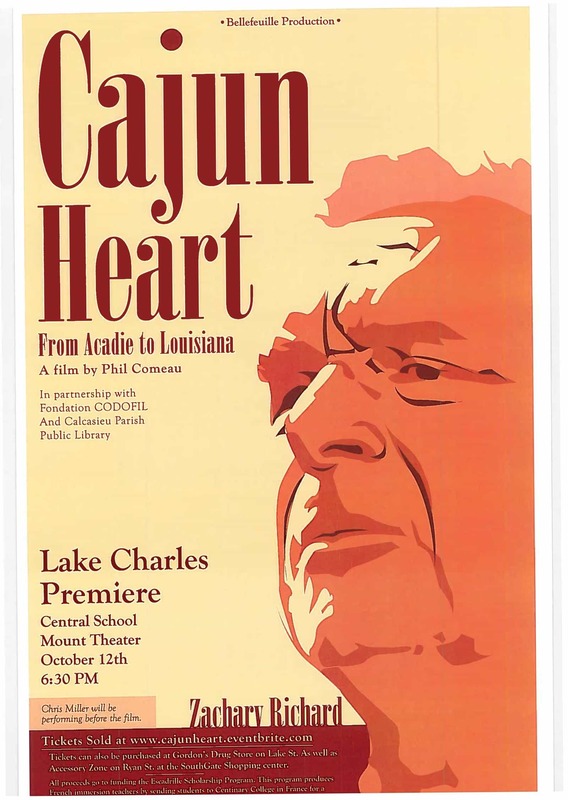 The showing of “Cajun Heart, From Acadie to Louisiana” will be on Thursday, October 12 at 6:30 pm at the Central School Mount Theater at 809 Kirby St., Lake Charles. Chris Miller will perform before the showing of the film. Tickets can be purchased from www.cajunheart.eventbrite.com or from Gordon’s Drug Store on Lake St., as well as from Accessory Zone on Ryan St. at the SouthGate Shopping Center or at the door on the night of the showing. The film was made in Acadia in the Maritime Provinces of Canada and in Louisiana. It explores the question of Acadian identity in Canada and in Louisiana and the links that unite Acadians throughout the world. Zachary Richard: Cajun Heart, a documentary of the history of the Cajun people starring international singer and composer Zachary Richard, is sponsored by La Fondation Louisiane, a not-for-profit foundation. All proceeds from the event will go to support the mission of CODOFIL in providing scholarships for Louisiana teachers to attend Centenary College in Louisiana and French universities to obtain a Master of Arts in Teaching. The teachers are required to return to Louisiana to teach in French immersion programs in Louisiana public schools. This beautiful, cinematic showcase follows renowned singer Zachary Richard on his quest to understand why Acadians and Cajuns are such a resilient people and to assess the status of the Acadian identity today. The film made its world premiere in November, 2016, at the Festival International du Cinema Francophone en Acadie, where it played to a 700+ sold out crowd at the historic Capitol Theatre in Moncton and won the Festival’s Best Documentary and Audience Awards. This event is hosted by the Lake Charles Chapter of the Council for the Development of French in Louisiana (CODOFIL) and the Calcasieu Parish Public Library. Tickets for students of all ages are $5.00 and tickets for adults are $25.00.